ItemBARK_1990.0003.0882.2 - Mr. and Mrs. C. D. Hoy, right, with an unidentified Chinese man at Warner Bros. Records Inc. in Burbank, California; circa 1958. Item BARK_1990.0003.0882.2 - Mr. and Mrs. C. D. Hoy, right, with an unidentified Chinese man at Warner Bros. Records Inc. in Burbank, California; circa 1958. 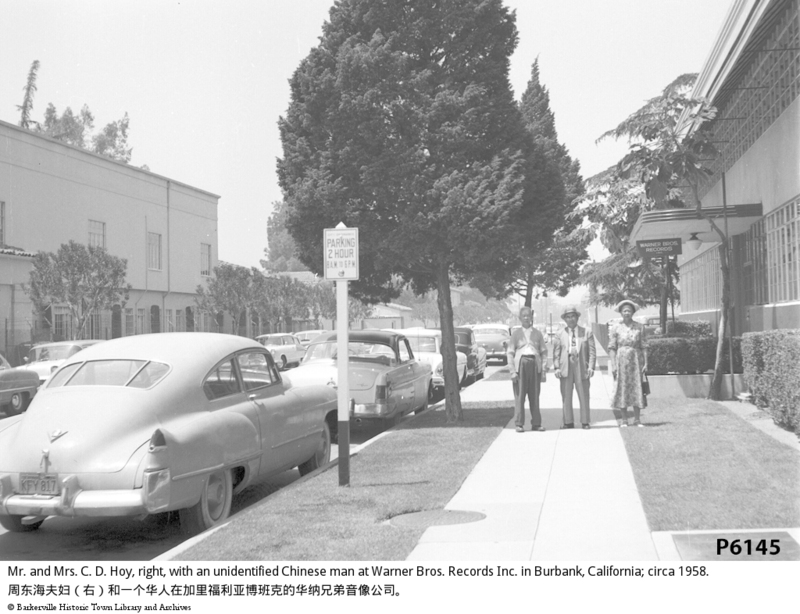 Depicts Mr. & Mrs. C. D. Hoy standing alongside a Chinese man in front of Warners Bros. Records Inc. office, possibly in Burbank, California. Warner Brothers Records was established in 1958, this photo would have to have been taken no earler than that.